Scott and Finn went off in a local boat to see some Japanese bombs left over from WWII. This whole region is full of sunken wrecks and jungle-hidden relics from the last two wars. Poor Papua New Guinea was really hit hard. On this island, the locals had to go and hide out the years of WWII in caves, hiding their babies and disguising the smoke from their fires as best they could. If the Japanese saw the smoke, they would throw a grenade. It seems that when the Japanese eventually beat a retreat they jettisoned their planes and tanks and left them to become new reefs and for people like us to snorkel on. This week alone we have dived on two tanks, several boats and a plane. When I say 'we', those of you that know me will realise that I stay firmly on the top of the water, whilst Scott and Seth dive down to sit in the cockpit of the sunken craft and Finn bobs around talking through his snorkel. We had a good week in Kavieng, anchored off the resort opposite the town. Although we have been careful to research the areas we would visit in PNG, there is the always the potential for some security problems, especially near towns. Resorts seem to offer a little protection for visiting yachts, as they patrol their beach areas and keep an eye on yachts and dinghies. They are also useful for locals knowledge. Most of them are set up to cater for people coming to dive or surf and make arrangements with local communities to pay a fee to use their beaches and waterways. Apparently in surfing season (which starts in October) in Kavieng you are not allowed to surf unless you are booked in and have paid a 10 kina ($5) daily fee! Scott has been looking for a surf break but hasn't been lucky yet. He's not that keen on having to book, either! We've been amazed at how expensive things are in PNG – at least 5 times the price of everywhere else we've been in the past 15 months. I suppose they are Australian prices – that is something we're going to have to adjust to (I wonder how we'll get on trying to trade at the check out of Coles??) - but they are must be crippling for local people. A jar of coffee is $16, a single tomato in the fresh market is 50c and even a coconut is $1. Local wages in the regional areas are very low (at the local copra plantation people get paid 60 kina a week) and transport between the islands, often used by those in paid work, is expensive. The people we meet are friendly and smiling. Many smiles are marred by betel nut-stained teeth. Betel nut is chewed everywhere by almost every man and woman, with streams of red juice being spat expertly on every side. The nut alone doesn't give the brief rush of euphoria. It is chewed with two other items - a portion of green mustard bean and a pinch of lime (as in an ingredient of cement, not the fruit!) - which turn the betel nut red and give a rush which lasts several minutes. Chewing is quite respectable, with the nuts being sold from small tables in neat rows on every corner. The resulting damage to teeth and gums is horrendous. That doesn't take the shine out of all the smiles, though - the people here are so lovely. We've been warmly welcomed by the people of Duke of York, especially here at Mioko island. Yesterday Scott went to the local touch football final, attended by almost everyone on the island. The match eventually had to be abandoned due to intra-village arguing over the score, but that is apparently quite normal. Today we were invited to visit a lovely man and his wife (Mr and Mrs Iona Alipet) who are building homestay cottages on their part of the beach. They presented us with bags of fresh vegetables and then we talked the afternoon away. This afternoon I was visited by two canoes of young girls who had noticed my painted toenails and had raided their gardens for tomatoes and chillies to exchange for nail varnish! From this quiet spot we will head into Kokopo, the major town of East New Britain since the 1994 volcano that destroyed Rabaul. Rabaul sits, regularly covered in volcanic ash, beneath two still smoking volcanos – Rabalankaia and Tavarvur. Hopefully they won't get busy whilst we are visiting. 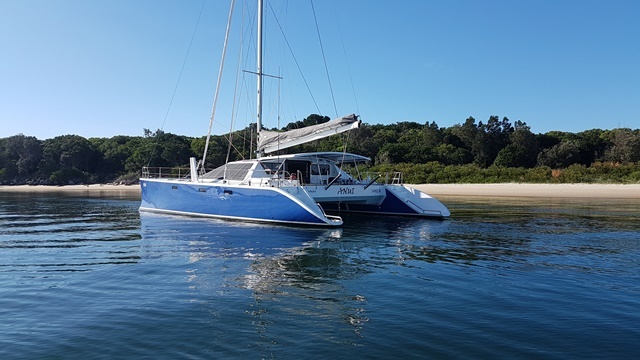 From Kokopo we'll sail South towards the Louisiades, where we plan to have a couple of relaxing weeks before it's time to hit Cairns and bring us back home. This will be the last blog entry until then – will have plenty more to tell you so watch this space. Oh, the alternator died, again. Guess what we'll be doing in Kokopo? Hope u have a wonderful cruise and hope to see u all back in Australia again. Rachel is from Malaysia, she saw the pictures that u have taken from Tioman Island. Her hometown not too far from Langkawi Island which is a nice small island located in North of Malaysia. Anyway will catch up with u guys again.